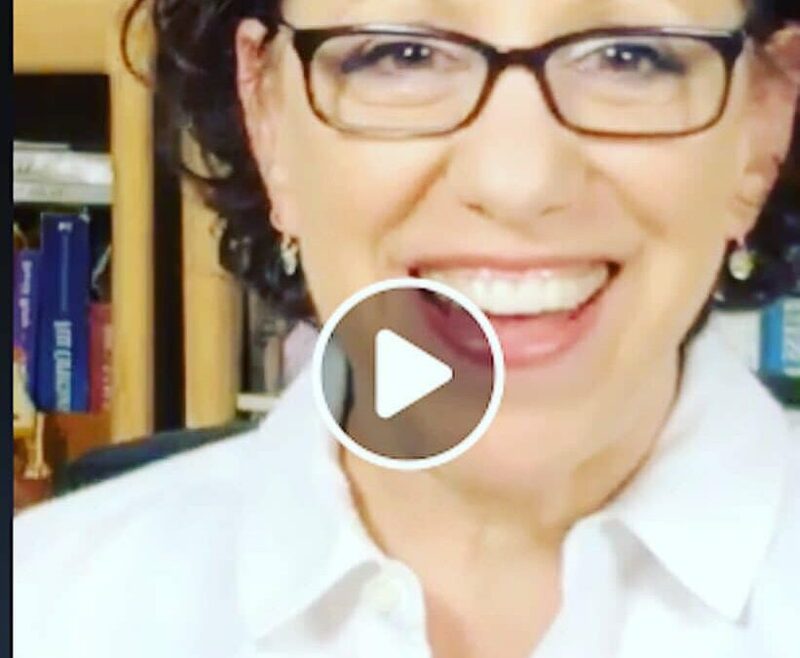 Here is my Facebook Live video, the second in a series about the pain and the magic of living a Passionate Life. You can watch it right HERE! The main focus of this video was Compassion. I have discovered that it’s not possible to live a truly Passionate Life without this essential element of compassion, for ourselves, for those we know, and for strangers who are different from us. I focused on compassion for strangers, those whom we don’t know and who come from completely different backgrounds. When we are compassionate with our own “tribe” or network, but not compassionate toward the “other,” we are missing a necessary piece to the picture of truly experiencing the magic of life. This type of compassion is not for the faint of heart. It’s painful. Compassion literally means “to suffer together.” But, this leads to the magic! Watch the video to see why such pain can lead to true magic and a more passionate life…and why I see Compassion as one of the 4 pillars of Living a Passionate Life. I went into more detail about what I consider to be the 4 Pillars of living a Passionate Life, with the outcome of experiencing a magical journey. These four pillars consist of embracing: 1. The Pain of Compassion; 2. The Sacrifice of Generosity Without Expectations; 3. The Relief of Gratitude; & 4. Our Dreams/Letting Our Imaginations Run Wild. However, in order to hold up these pillars without developing “compassion fatigue,” or just fatigue, we need to rely on the bricks in the foundation: Self-Care of Body (what we ingest, moving, sleeping) and of Mind (pausing, mindfulness, forgiveness, challenging our own inner troll, being open to our dreams and to the magical synchronicities along our path). As I mentioned in the last FB Live video, I’ve been focusing on one of the bricks, and that is my own 40-day challenge to myself to meditate every day for at least 9 minutes, which I’ve already increased to 18 minutes because it’s starting to feel good. I, myself, wasn’t taking care of myself and I was starting to experience sleeplessness, frustration, fatigue, and difficulty creating, having trouble holding up the pillars! Just showing up daily for a brief meditation has already made a significant difference in my sleep, energy, creativity, and my ability to embrace the 4 pillars of Passion and to experience the magic again! In the 20 days of the challenge, I did miss a couple of days. And I noticed that, when I didn’t show up, I wasn’t at my best that day! When I came back to sit on my pillow, close my eyes, and focus on my breath, it was like coming home. In Psychology, we would call that an A-B-A-B Experimental Design! It wasn’t an intentional experiment, but I learned a lesson from it! On my website, there’s a meditation that I created, Inner Peace, Joy, and Vitality. Feel free to download it as a guide, but there are many others on YouTube that you can follow, as well. In my FB Live video, I also discuss some of the visual imagery I use to go deeper into a meditation. Just remember, there’s no such thing as meditating “perfectly.” Just show up and leave your smart phone off. If you hop on board with this, let me know how it’s going! Send me an e-mail: drmara@drmarakarpel.com. Or message me on FB! 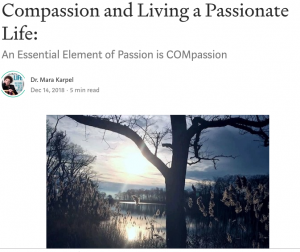 You can read more about compassion in the blog, Compassion and Living a Passionate Life: An Essential Element of Passion is COMpassion, which I wrote for Arianna Huffington’s ThriveGlobal.com in December 2018, right HERE! Wherever you are along this journey, whatever age, whatever stage, whatever state of life, it’s the perfect place to start and I hope you’ll continue to journey along with me. BTW, you can still check out my guide-book for the journey, The Passionate Life: Creating Vitality & Joy at Any Age, and be sure to stay tuned for my up-coming on-line course, Living the Passionate Life. Meanwhile, tune in for more in my FB Live series! And be sure to listen my Blog Talk Radio show, Dr. Mara Karpel & Your Golden Years, on livestream (Sundays at 5pm CT/6pm ET) or ANY TIME on podcast, to hear from awesome experts with their tips on health, wellness, and living your best life!